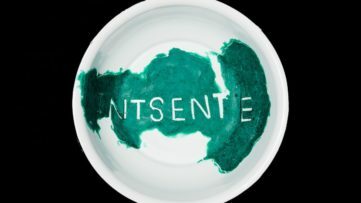 Through art, its creators often communicate the past, use its symbolism to transmit faraway messages and translate them in a contemporary language that we easily recognise. 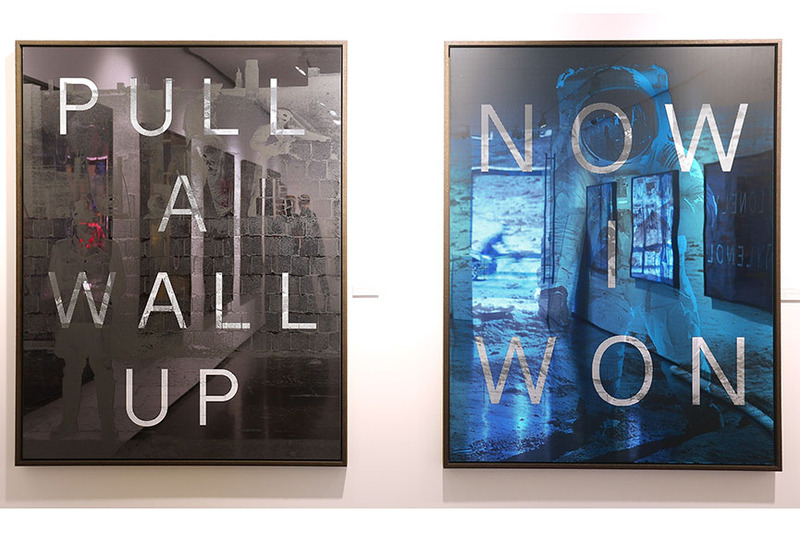 In the work of Massimo Agostinelli, we can find many familiar images, accompanied by palindromes – words, phrases or sequences that read the same backwards as forwards. If the images speak a thousand words, then these speak even more than that, carrying both clear and ambiguous messages that make you wonder, realise, explore and contemplate. We had a chance to talk to this young Italian-American emerging contemporary artist. 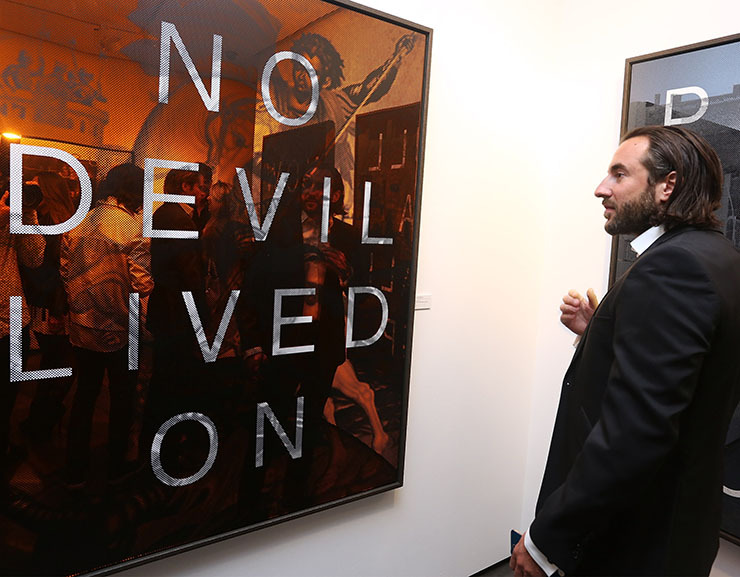 Originally from New York, Massimo Agostinelli has been called the next Ed Ruscha, and his first solo exhibition at London’s Hus Gallery sold out on the opening night, a success which led to a new show coming up next month at Hoerle Guggenheim Gallery in New York. 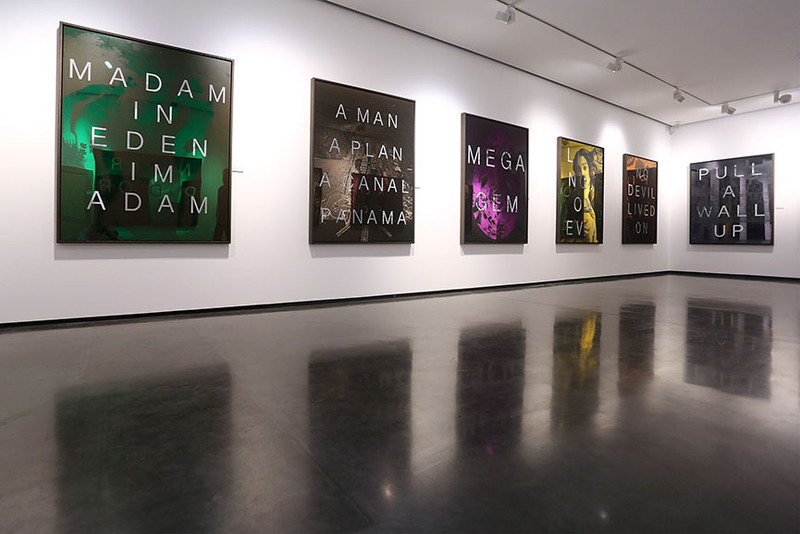 In his most famous work to date, Palindromes, the artist created a marriage between the past and the contemporary, mixing allegories from Greek mythology and Renaissance painting with 20th century politics and modern day popular culture – at the same time entwining unique palindromic phrases into each of these mirrored canvas sheets. 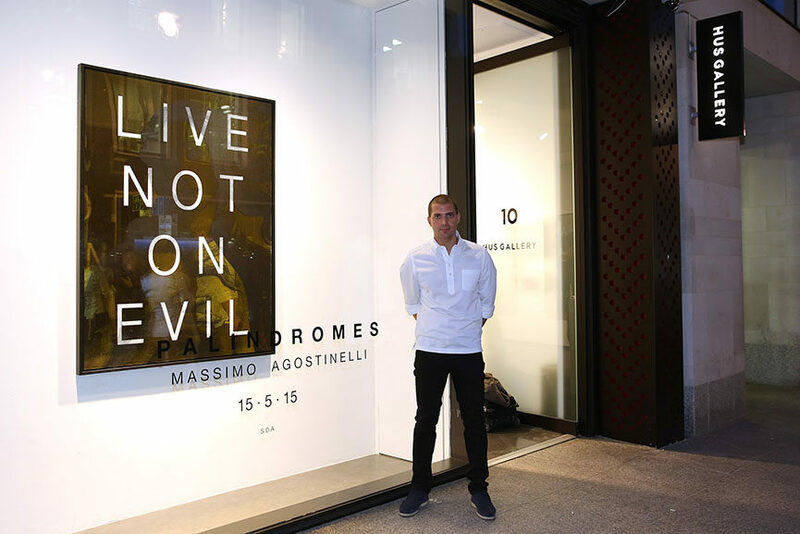 In his interview with Widewalls, Massimo Agostinelli talks about his rather interesting upbringing in one of the most art-involved cities in the world, the influence his family and other artists had on him, his many travels and schools and how it all helped shape his career and life. We also talked about the Palindromes series, and how they came to life. Finally, we talked about the exciting future and the upcoming shows, because we are sure this talented young man will stick around for a while. Scroll down to read our little chat and check out the photos! 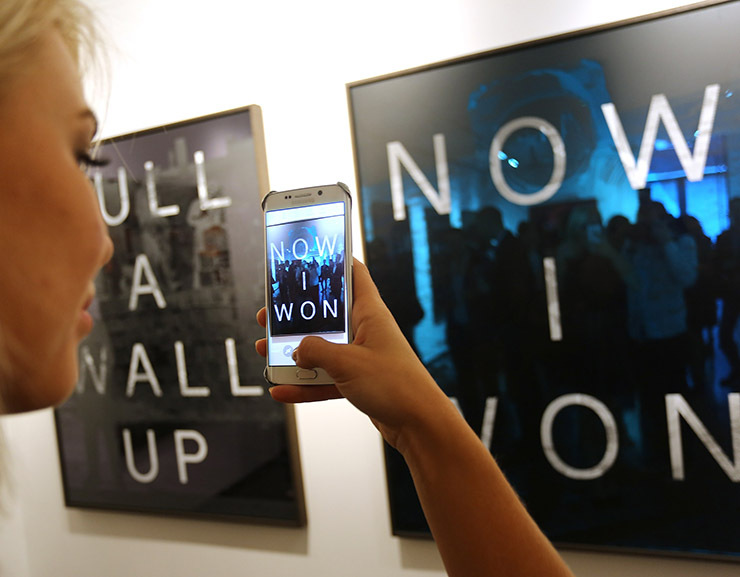 Widewalls: How did you become an artist? Was it something you always wanted to be or did you have a particular inspirational moment? 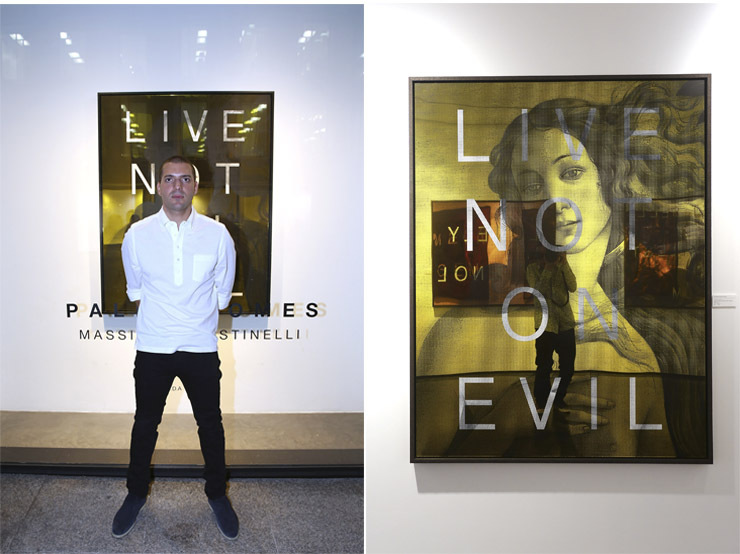 Massimo Agostinelli: I’ve always been an artist, even before I could hold a pencil, let’s just say as a child I was very “hands on”… In fact my mother is an artist and sculptor, so growing up in New York City I would usually spend my weekends in Brooklyn at her foundry watching her sculpt and basically drawing nonstop. I would always carry around my sketchpad, I was a bit of a nerd to be honest. On the other hand my father is a passionate art collector and he would often take me with him me to galleries and museums. I remember one instance where he took me to Christie’s Auction House on Park Avenue in New York when I was only 8 years old, he let me raise the paddle to place a winning bid, that was a moment I will never forget. 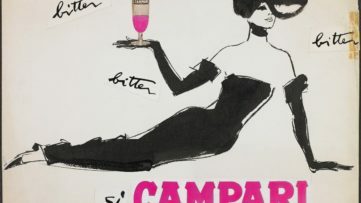 It actually happened again recently at Sotheby’s Auction House in London on Bond Street, we like to collect! 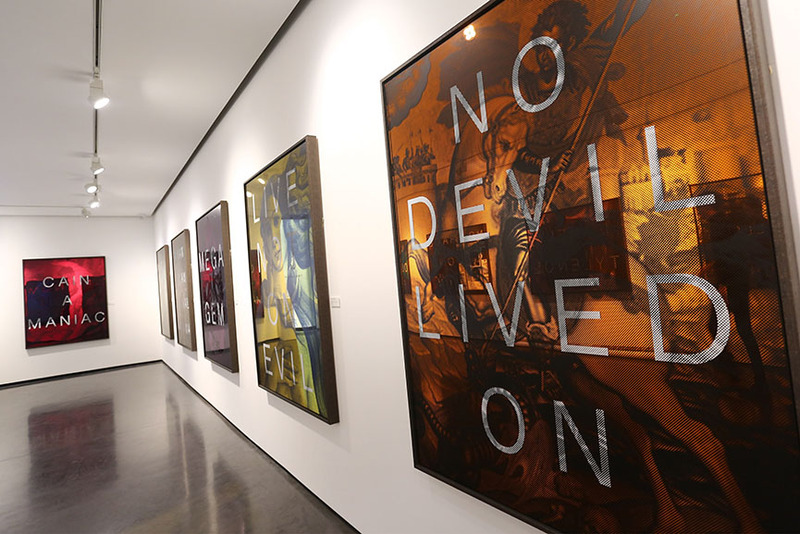 Although of course I agree the the price a piece of art was sold for or what people say it’s worth is important for the market especially for investors and collectors alike, the real value and weight to me is derived from the meaning of the art itself. For example: Specifically the importance of the message it conveys to people, this is what inspires me to create something that will be essentially remembered long after I’m gone and hopefully inspire others to do the same and at least be able to acknowledge and in an ideal world be able to act upon the right messages. I guess a good example of this would how in the early 1900’s Pablo Picasso inspired so many fellow artists to follow in his footsteps and today he’s an icon. 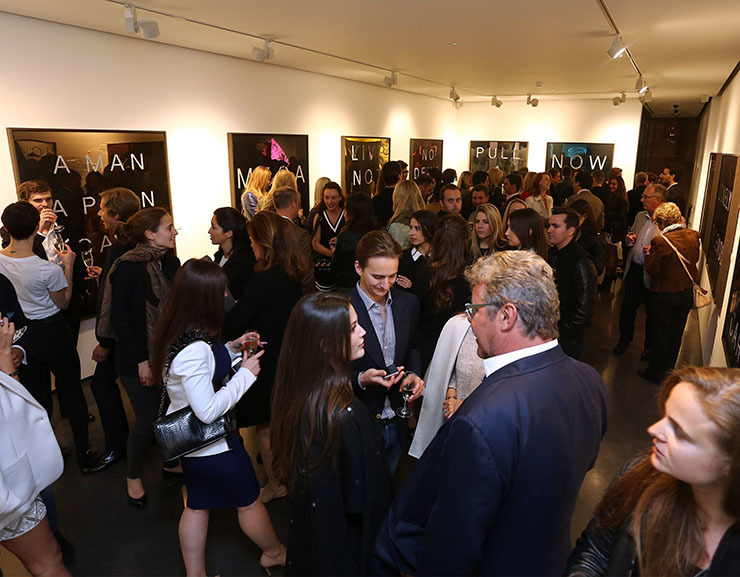 Widewalls: You’ve studied in places like Switzerland, the US and the UK. Can you tell us how you think these different environments affected or influenced your artistic approach? MA: Being an international student and traveling extensively from a very young age definitely enhanced my general artistic outlook on life. However, I found it was most often the simpler and more familiar things in my life, which led to an overall deeper and broader understanding. 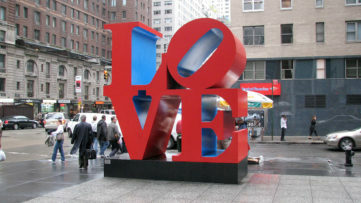 For example; growing up in Manhattan, New York City gave me direct access to the Museum of Modern, Guggenheim Museum, Whitney Museum, Frick Collection and of course my favorite the Metropolitan Museum of Art all of which were right on my “door step”. People travel from all around the world to get a brief glimpse of that rich and intense learning environment.. with an endless supply of art and beauty to inspire me every single day, for me I think that was the greatest influence on my artistic approach. I also spent many years growing up in Switzerland studying closely with my brothers Giovanni and Stefano where we attended Aiglon College and Le Rosey which allowed me to gain international academic exposure not to mention visiting the Art Basel Art fair every single year. Coupled with my Art & Design A Level in England and Bachelor of Arts University degree in London, England which again had so much to offer.. familiarizing myself with the Tate Modern, V&A, Saatchi Gallery among other major exhibitions and galleries..the list goes on, I was truly very lucky and I still visit them on a regular basis, I just can’t get enough. 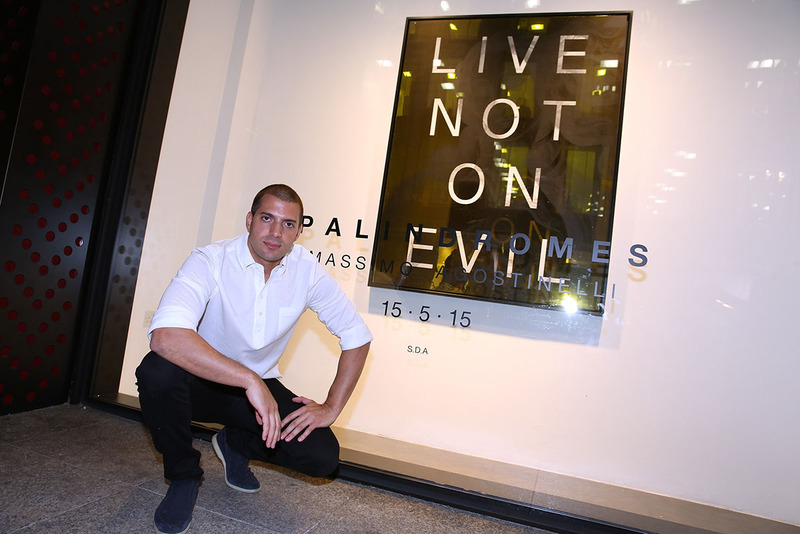 Widewalls: Let’s talk about Palindromes. What is behind your decision to choose these particular images and painting? MA: There are two subjects in school, which I’ve always naturally excelled at, Art & Design and English Literature. I wanted to find a way to create a fusion or bond between words and imagery. The Palindromes are crafted and selected very carefully to ensure their messages can be paired with equally powerful and meaningful images. The two components must correlate seamlessly and essentially become at one with one another. I call it a “symbiotic connection”, when I find the perfect balance between text and imagery. Im fascinated and deeply passionate about graphic design, typography and even word play, especially Text Art. For me it’s important to ensure that the work is re-emphasized by its medium in every way possible. Choosing and pairing the ‘palindromic phrases’ with the specific imagery definitely takes time and not only does it take time but it requires extensive trial and error to ensure each one matches perfectly. 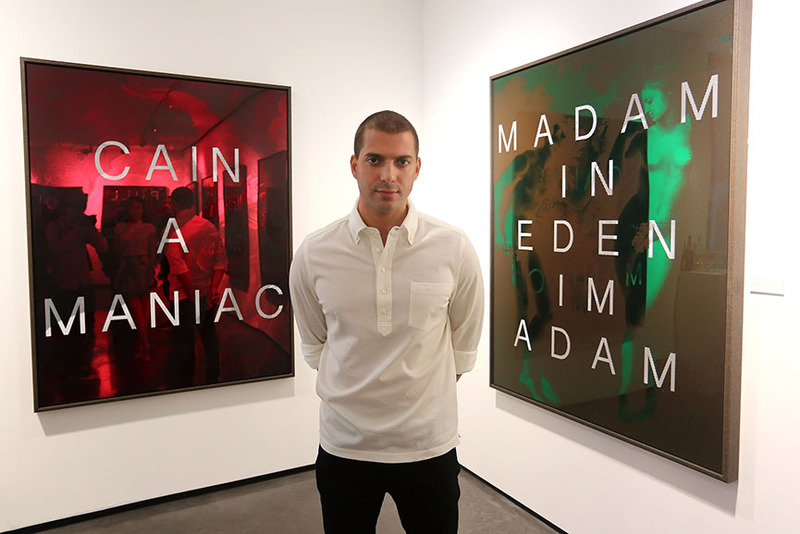 For examples with MADAM IN EDEN IM ADAM, I wanted to find something that could match this sentence and knowing the iconic Peter Paul Reuben’s Adam & Eve painting I felt compelled to incorporate it through the use of appropriation to make the piece essentially a modern day reinvention of a masterpiece. The dark green represents the greenery of the Garden of Eden, the color of the snake and of course the very tempting Granny Smith green apple! I systematically scour the web, data archives, dictionaries, books, magazines, newspapers, movies or more often taking my own photographs of something that i have put together myself in order to find exactly what I need. Sometimes they just occur to me while I’m walking down the street and in some cases I gain inspiration for a specific theme from listening to music and using my imagination. Widewalls: Can you give us some examples of people, celebrities, artists or even instances that have inspired and influenced you in your art career? MA: I’ve had a lot of inspiration early on in my life through living with great pieces of art and getting influenced by exceptionally talented people. For example my god father, Guy Naggar taught me what It meant to collect great art and how to build a collection that stood the test of time. Another extremely influential person to me was my best friends father, David Nahmad. I remember one day at the Helly Nahmad Gallery below the Carlyle Hotel in New York on Madison Avenue he explained to me why art was so important, he said: “There’s nothing more authentic than great art.” To me that profound and truthful phrase is often something I reflect on when conceptualizing my work. Another highly influential person early on in my career was Taryn Simons and Larry Gagosian who I spent time with in Los Angeles, they made me realize the importance of presentation and just how crucial it is to pay attention to detail. For this reason I only work with the highest grade materials and the best framers in the world which is why I work with John Jones Framers. I suppose the most influential person was and is my mother, Pascale Gallais. She would take me to The Maeght Foundation as a child to train my eyes and give me the acquired knowledge to understand true beauty because ultimately it’s in my blood to do be an artist. 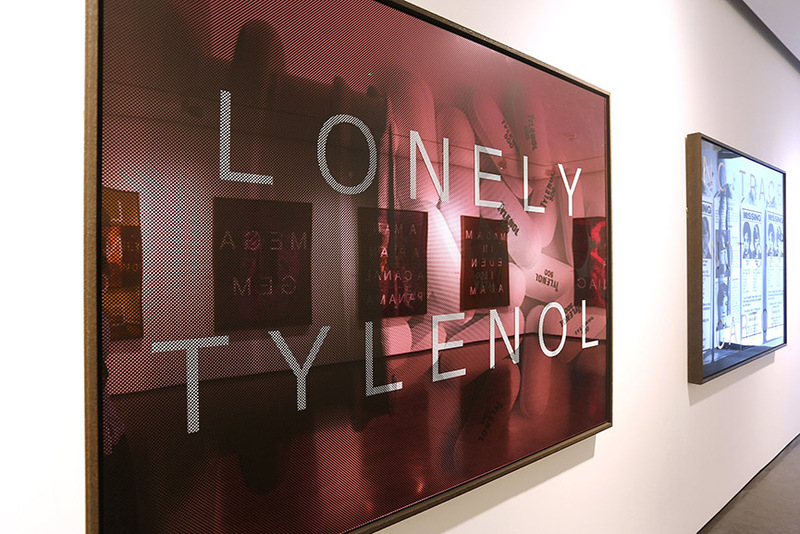 Widewalls: You’ve been dubbed the next Ed Ruscha, are there any other artist that inspire you? 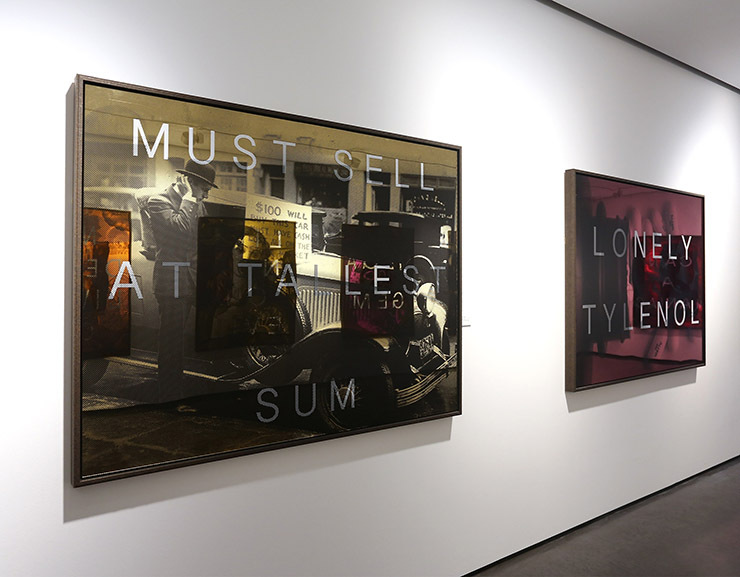 MA: Edward Ruscha is certainly an artist I greatly admire and I’m honored to be in the same sentence as him however I’m just Massimo Agostinelli. I suppose there have always been artists that have helped define my career path as both an artist and individual. To me, artists come in all different forms, for example Elon Musk is someone who has shaped my outlook on life in a big way, his persistence and perseverance demonstrates that anything is possible and the sky really is no longer the limit. Ernesto Bertarelli has also given me innovative and visionary inspiration. Growing up I would watch David Attenborough and Carl Sagan religiously, these epic men helped enhance my views of our universe. Conventionally speaking they’re not “artists” as we know them but to me they are and that’s the beauty of art, it’s continuously changing, as it evolves we grow with it. Those who have the biggest, brightest imaginations and choose to act upon it through spreading knowledge and creations will give birth to a knew generation of artists/people in all fields from spirituality to technology. 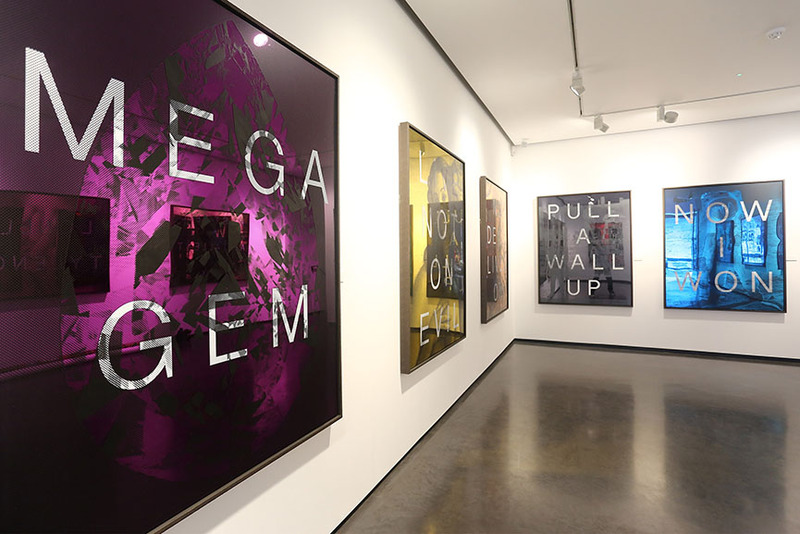 Widewalls: Your solo show entitled Palindromes at Hus Gallery included works on colored mirror, are there any other mediums and techniques you are working with? MA: I’ve been experimenting and working with mirrors for a few years now and at the moment I’m working on something particularly unique and special which i’m truly excited about unveiling. I try not to over plan and instead let things happen naturally but this is a project I’ve been working on for a long time and I strongly believe it will continue to evolve organically while remaining true to the original themes. One medium which I feel will always be incorporated in some way is stencil text in block capital font which I developed. and the techniques will always vary depending on the circumstances at hand, literally. I work with what I have and what’s available to me, the key is to always make the best of your ingredients. 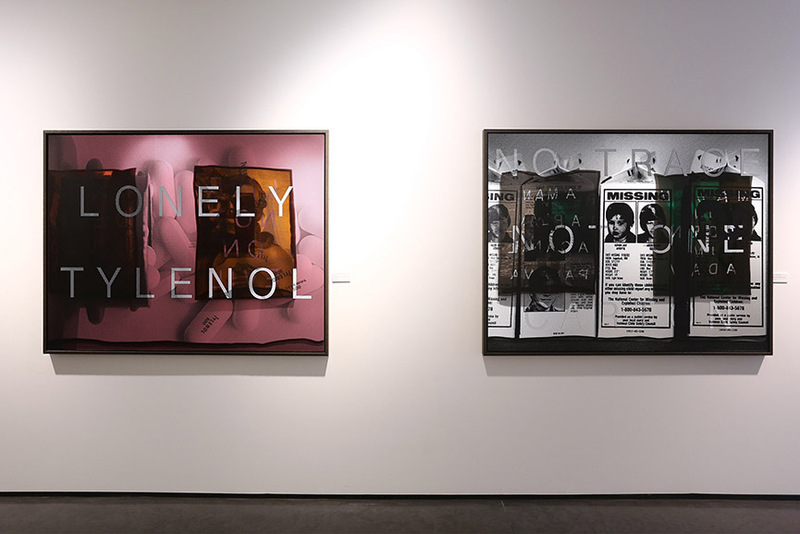 Widewalls: When can we anticipate your next solo show and where will it be? MA: My next solo show will be in New York at the Hoerle Guggenheim Gallery in October. I had a small show in Monte Carlo, Monaco this summer which was a huge success and I’ve also been exhibiting my work in Gstaad Switzerland at the Alpina Hotel where I am apart of their permanent private collection as well as the Reagan Museum in Los Angeles. For more artist interviews, subscribe for My Widewalls today! 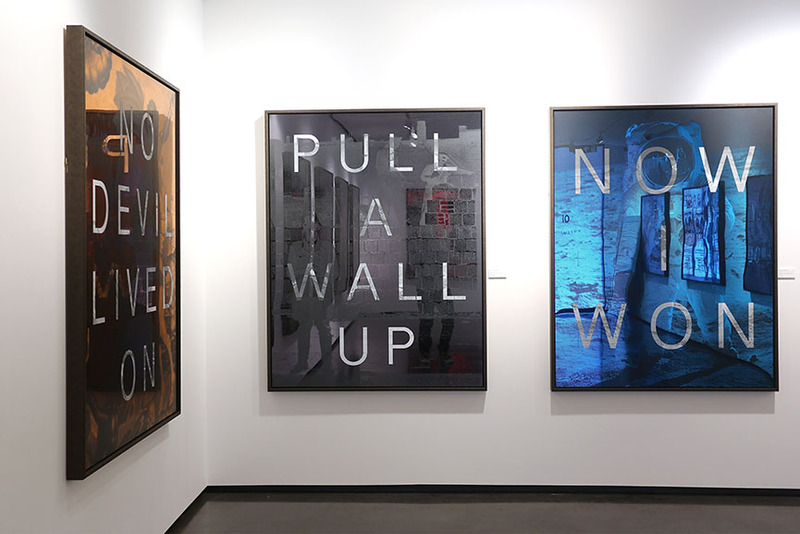 Word-Based Art For Your Collection!